Even Jesus had a moment of doubt. Is it part of the process? Within most wisdom traditions there are elements that are clear cut (thou shall not steal), and elements that are more mysterious. It’s these more mysterious elements excite me most, and where the biggest opportunities for growth are. And perhaps it’s only because you’ve got to put a little work into understand them. They bring you into active relationship, and ask you to engage. There doesn’t seem to be a clear understanding of what these words and this event mean. Jesus died soon after and wasn’t able to explain it. We have to understand it for ourselves. I don’t want to go into the spiritual significance, though it has the weight of something profound. I’ll leave that to people with a better handle on theology than I have. But still I find this story inspiring. Because I think we all have these moments (though obviously in a far less intense way) of doubt. And particularly, it seems that there is this doubt that comes right before realisation. Like you can be working on a project for ages. It all feels like it’s going well, there are amazing synchronicities showing up all over the place, and you feel like you’re totally ‘on your path’. This happens to the best of us, more than we like to admit. In fact, I’ve seen it so much, that I wonder if it is part of the process. If doubt itself is a catalytic agent – a necessary ingredient of success. Belief is important too. Essential. But self-belief is not the opposite of doubt. One doesn’t necessarily preclude the other. 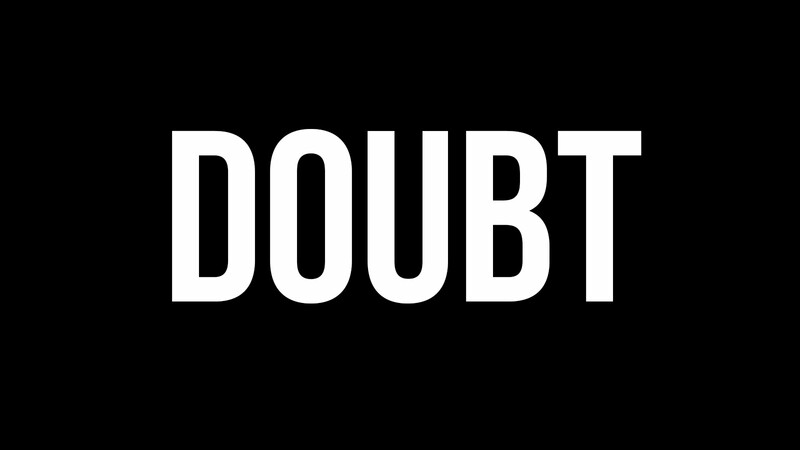 Doubt is healthy. It’s an important moment of humility. A moment of letting go and letting the currents take you onwards. And perhaps, it comes from your higher soul. Just as you are about to taste success, your higher soul finds a way to put you back in your place. Yes, success is yours, but there was an entire universe playing a supportive role here. That role needs to be acknowledged. Now I’m pretty sure that whatever spiritual lessons might be found in Christ’s moment of doubt, this isn’t the take home. I’m pretty sure it wasn’t a lesson in balanced self-belief. But I still find comfort in the fact that even Christ, at the hour of perfection, still had a moment of doubt. It makes me feel ok about the doubt that comes into everything we do. And it allows me to think that maybe it is a necessary part of the process and welcome it as such. And it reminds me to be humble. That’s my thoughts. What about you?